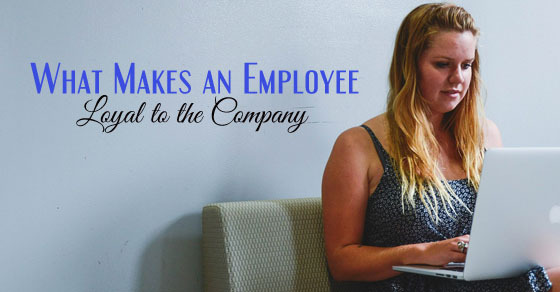 Loyal Employees: What Makes an Employee Loyal to a Company? A loyal employee to an organization is just like a healthy fruit to the body. The more you have, the more you will benefit! Just like consuming healthy fruits keep the internal structure of the body fine and promote its development, employee loyalty is helpful in maintaining positive work culture and always work towards betterment of the company. If you are thinking that a loyal employee is one who is working for a longer tenure in the company, then probably you are assuming it in the wrong sense. Long employee tenure does not provide enough sense of being loyal. An employee working for longer years in a company is not a certificate for his unquestionable loyalty. Even if an employee has worked for a short tenure, but has always work harder for growth of the organization, and that is measurable in his daily actions, then definitely he is a loyal employee. To comprehend better, you may read on to a precise definition of employee loyalty. Employee loyalty to a company refers to employees who are dedicated to the growth of their company and consider being an employee of the organization as in their best interest. Such employees are faithful to the company; possess strong feelings of care, responsibility, and bonding. They have a powerful willingness to make an investment or even go for personal sacrifice for the well-being of the company. Employee loyalty is a two-way process. If an organization expects an employee to be loyal then even the organization needs to serve the employee with equally trustworthy means. It is because today, the employee’s loyalty differs from what it was during the traditional period. There were times when loyal employees used to be praised by managers and the employees were happy enough even if the manager remembers them. Today however, things have changed. Everyone expects to receive immediate employee benefits from the company as a return gift to their loyalty towards the organization. So for a company lucky to have loyal employees, it is vital to pay them back at regular intervals for their unquestionable loyalty. The following mentioned are few qualities of a truly loyal employees. Doing the job in most efficient manner is also being loyal to yourself. No matter what, an employee should always have the feeling to do his work in a best way as possible as this is the most customary way to win over the organization’s trust. If you are proud of what you are doing then definitely you will deliver best outputs. If you are satisfied with your job then your delivery results will obviously be outstanding. With new things entering the world again and again, and novel technological innovations, it is essential for an employee to remain updated and be open to learn the advancements. If you are a loyal employee of the organization then you should always be ready to advance in your niche. Being loyal does not imply that you have to prove anything to anyone. You have to be wise and make sure to avoid meeting unrequired risks that might come back to bite you. It is a corporate world and everyone here is to perform better and earn better. So if someone states to accompany you for long years of your professional tenure then do not have a blind faith on it. Making good connections is great, but also do remember that everyone outside there is to make his own career. Placing certain obligations on the employees is essential, but that does not imply that you constantly poke them. Let your employees be free as they are mature enough to handle things on their own. Encourage them to explore new opportunities and let them grow. If a loyal employee grows then the company will also grow and vice versa. Organizations should not put a thumb over their employees as this can hamper their progress. Let them think, plan, and execute. Be always there to support their beneficiary remarks. Just like customer satisfaction, even fostering or improving employee satisfaction is equally important. If you have satisfied loyal employees, then they would give it all to keep your customers satisfied, and this is how your business can grow remarkably well. Loyal employees are positive personalities who are always coming with innovative techniques and potentials to bring maximum growth to their organization. They are always willing to work hard and offer a company with high levels of output. Here along with organization growth, employee productivity is also seen. Employees who are loyal are not self-centered individuals. They always work for the company and comprehend very well that happy customers is the way to achieve success. To build new customers and retain the old ones, it is vital for the company to have loyal employees in its team. A large portion of your company’s image is structured by your employees. It is your employees who produce a product and market it under your brand. This implies that they are solely carrying the burden of advancing your company’s image on their shoulders. To enhance this image, without meeting too much expense, it is wise for an organization to respect loyal employees and give the same respect and loyalty to them in return. Employees loyal to an organization work only to achieve their organizational goals. They are genuine professionals who do not have any personal goal and even the company can rely on them to meet their succession plan. Loyal employees are always there with the ups and downs of the company and can hence support organizations to achieve their goals in short time span. Every company is constantly planning for its growth, but only few of them are able to achieve it. One main cause for this is the never ending process of hiring and firing. But, if you have certain pool of employees who are not only loyal to you, but are even plan to work long with your firm, then definitely you can plan more productive projects based on strengths and availability of your manpower. It is one thing that most companies lack these days, and if you have it then don’t let it go at any cost! Every employee, whether senior or junior, wish to correlates with an organization that is booming and have further plans for advancement. Your employees should feel positive energy flowing in the environment. To do this, you need to ensure that you are working towards betterment of the employees. Once the employees get convinced that every managerial action is performed for their growth and success, then even they are going to put actions that are in favor of company’s growth. Culture of a company is very much vital for its success. An interactive culture, where the manager is ready to meet and talk to the employees is always fruitful. As a manager, it is your responsibility to look out for issues with the employees and try to solve it as early as possible. This holds true despite of size of your organization. If an employee is constantly facing problem in your firm, then no matter how big your company is, you will end up losing a loyal, productive employee. Importance of employee engagement is high and also balancing employee engagement is the most vital component of employee loyalty. The manager must try to get engaged with the employee at least at individual level if not at personal level. The manager must keep an eye on the water cooler gossips, participation of every employee in the company’s event or employee programs, and more. It is because such engagement helps an employer to have an unbiased opinion of its employee. An employee gets frustrated in short time span if he is not offered with a learning environment. Every employee is new in his field, but still he is always in hunt for novel things that can help him become more superior to his previous performance. If you wish employee retention of your loyal employees and boost their productivity then always offer them with a platform where they can learn more new things, either within their department, or from other departments. Problems occur in every firm. It is management’s responsibility to introduce a well structure system for resolving disputes in a balanced and fair style. Make sure that your dispute system is not arbitrary, as otherwise you may face issues like exclusion, favoritism, and possibly discrimination. Employees love, and are loyal to manager who is neutral to all. When an employee visits a manager with his problem then the manager must try to solve it rather than create a mess out of it. A manager must be sensitive to his employee’s emotions and must try to solve his employee problem in as easy manner as possible. An employee bringing his problem to a manager is a great sign of employee loyalty. Like a manager, if you expect your employee to shed you respect then even you are expected to offer him with same respect. Relate to your employees as much as possible. Rather than being a stubborn boss you need to be a friendly and interactive boss, especially with employees of today’s arena. Employees may lose managers trust in the workplace who are constantly poking them in their job. If as a manager, you are constantly looking over their shoulder, then this is definitely a step towards developing distrust and animosity in your employees. A better idea is to set reachable goals and provide your subordinates with required resources to get the job finish on time. Then you may sit for feedbacks to mold their performance positively. Loyal employees are hard to find these days. If you have few then try to retain them, but if not then you should try to maintain a healthy work culture in your organizations by following the ways to boost employee loyalty. Loyalty of an employee is directly or indirectly related to the success of the organization, depending on the company’s size. If as a manager, you really wish to earn employee loyalty then try developing it bit by it, as every bit counts and you will reap what you will sow.